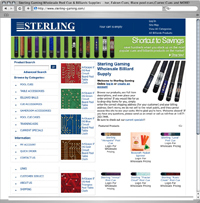 Many sites in this group suffer from navigation overkill, but Sterling Gaming captures us with its balanced menu split into two sections. Despite spies needing to keep their identities secret, these sites must reveal the people behind them or else they lose trust and credibility. It's a way to put a face on a company. The company's "About" page provides background information complete with personnel bios and photos. Every product comes with details and large photos for close ups. We let the small font and 2005 copyright go because the site blows away others in this category. It also has a big sign that says, "Shortcut to Savings" that leads to a blank page. Although guilty of a crowded menu and home page, Seybert's contains all the necessary equipment to make it an effective online retailer site. An important component of any shopping site is security. Seybert's clearly displays a security logo that links to details about the security of the site plus it has a page about safe and secure online ordering. The retailer includes an active forum where consumers discuss products and ask questions, a welcome way to engage customers. Also important on retail sites are shipping information, privacy and return policies and company information. Seybert's has it all. Every page displays the company's phone number and store hours for easy finding. If Seybert's tones down the content and menu, it site could be a future top agent. 007 may have a license to kill, but he radiates class in his choice of fine dining, cars and the posh places he frequents. 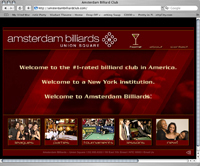 Amsterdam Billiards has this in common with Bond and includes a martini glass to boot. Sites in this category need to display their locations, phone numbers and hours in a prominent place. After all, locals come to these sites looking for that information along with menus, upcoming events, party information and other details. The home page video gives you a good feel for the place. We also appreciate it has a visible "off" button so you can turn mute the sound. Amsterdam carries the latest gadgets in its pocket by regularly updating its Facebook page. Next time we land a mission in New York, count on us to stop by this classy joint to take a deserved break from the espionage game. Yankee Doodles emanates such a fun, casual atmosphere that it almost gives us an excuse to head to Santa Monica to hang out. Alas, our mission keeps us grounded. As expected, the site prominently displays its address and phone number with quick access to its hours. Yankee Doodles' 28 pool tables are just so dandy that we want to come to town and play. We had to relegate Yankee Doodles as a runner-up because its constantly changing images and blinking text distracts from the rest of the site. Some parts, especially the current events page, look busy. 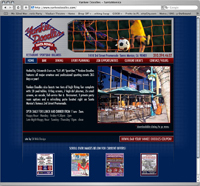 Another bonus: Yankee Doodles has a coupon on its Web site to reward visitors for stopping by.